Home Crepe Blog Holy Crepes! Valentine’s Day is Just Around the Corner! Holy Crepes! Valentine’s Day is Just Around the Corner! Whether you are celebrating your first Valentine’s Day with that special someone or have shared many years together, the holiday of love is the perfect day to show them you care. Sharing a meal is a fun, romantic way to enjoy each other’s company. There’s something irresistibly romantic about flour, sugar, eggs, milk and butter whisked together, cooked paper-thin and wrapped around savory or sweet ingredients. That’s why crepes, those intoxicating French pancakes, fit the bill for a Valentine’s Day meal for two. Crepes are one of the most versatile foods. They can be prepared to be sweet or savory, with countless ingredients and customizations. They can also be served at any time of the day, for any meal. Crepes make for the perfect breakfast, lunch, dinner, or dessert, which is why they are the perfect choice for your Valentine’s Day this year. Breakfast in Bed: What better way to wake up your Valentine than for some warm and delicious crepes? The aroma will make it easy to wake up and the gesture will start the day off on the ideal romantic note. Dinner: If your loved one is not a morning person, take them out for crepes or bring some home to share for dinner. Order different kinds to share and enjoy your partner’s company. Dessert: Crepes also make a fantastic dessert. Whether you want to satisfy their sweet tooth during the day or after dinner, crepes are a creative and yummy alternative to the traditional box of chocolates. 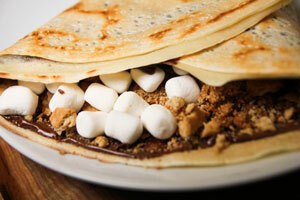 Our Want S’mores Crepe is on special this month and is the perfect treat for your sweetheart. With the option of adding any of our spectacular gelato flavours to your crepes, it will be a tough but tasty choice to make. Choose between flavours like chocolate mint, salted caramel, pistachio, raspberry and cheesecake gelato – just to name a few. Come in and see our full selection of gelato flavours, and see why Crepe Delicious will keep you coming back. Whether you want to start Valentine’s Day with delicious crepes or serve them as dessert later in the evening, Crepe Delicious has you covered. Find a location near you and try your favourite crepe before ordering for your special day.